You don't vote for Kings! As Monty Python said, "You don't vote for Kings!" So the question is then how do you become the elected King of Australia? Dr Glenn Davies writes. 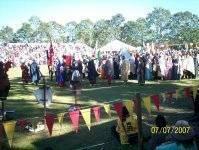 On the weekend of 10-11 July 2010, Australia's own home-grown king along with his nobles and courtiers took to the Field of St Michael's, during the Abbey Medieval Festival. This is the largest authentic medieval re-enactment event in Australia. It spans a thousand years from Europe's Dark Ages to the High Middle Ages, roughly AD600 to 1600. In 2010, approximately 20,000 people participated in the weekend Tournament outside Caboolture, north of Brisbane. The Australian Crown on the field came into being in 2000, when the Baronry's, Shire's, College's, and Canton's of Australia voted in favour to advance to Kingdom status, to split from the Kingdom of the West (the West coast US) and rule themselves as the Kingdom of Lochac. As the seventeenth kingdom of the Society for Creative Anachronism (SCA), a historical re-creation and living history group founded in California in 1966 which recreates pre-17th century Western European history, life and culture of the landed nobility, the Kingdom of Lochac encompasses all Australian states and New Zealand. Viscount Baronress Mistress Rowan Perigrynne said at the time, "I love the West and always will, as a child loves its parents. Yet every child grows up and makes their own way in the world, and the parents rejoice to see them stand on their own! I believe we are ready to make the next step, take the next challenge, and celebrate the dawn of the Kingdom of Lochac. This would truly be the fulfillment of my dream of so many years ago." Yolande Kesteven also said, "I know that Lochac is a part of the Kingdom of the West, and that makes a difference to me when I swear fealty, when I give the Royal Toast, do Princess things, and when I call for three cheers in my student Heralding moments. But these are the only times it really makes a difference to me. For the rest of the time, there is only Lochac. And while the West is very dear to me, it is a separate place, far away". The echoes of the arguments put forward for the Yes vote in the 1999 republican referendum resound clearly through these comments. As Australia matures as a nation there comes a time when the child grows up and cuts the apron strings. A year after the defeat of the 1999 referendum the Lochac Kingdom Poll was successful. The Australian Crown of Lochac is chosen in a different way to that of the British Crown. To become King of Lochac a candidate must win a Crown Tournament through combat on the field, to hold the Crown for a period of six months. Of course, this was not how medieval monarchs were chosen. Certainly many Kings were crowned after having conquered a kingdom through right of arms, but the crown tournament model of selecting Kings is purely a SCA process. Even though Monty Python's character King Arthur said it was by divine providence that he became King through presentation of Excalibur by the Lady in the Lake, the Anglo-Saxon Kings were actually elected by the witan, a group of self-interested land holders who could raise a large enough fighting force to cause trouble if they didn't get their own way. This process of appointment through consent is not unique but certainly unusual. Britain had twice been momentarily an elective monarchy, in the sense that new monarchs were appointed by a process of consent - William-and-Mary and George 1. Maybe three times, insofar as George VI succeeded Edward VIII not strictly by hereditary right but by the explicit consent of the governments of the Empire. Of course, a monarch ruling over Australian's is an absurd fiction, whether it is a right of arms medieval re-enactment King, or the hereditary British monarch. Although the nobles of Lochac may enjoy the pageantry of recreating times gone by, for those of us in the mundane world the sooner Australian's create a republic the better.